A card from my November 2015 SCS DD time. Each month has a theme; if you are a member of the Fan Club, you can view more details about this card and its relation to the theme here. 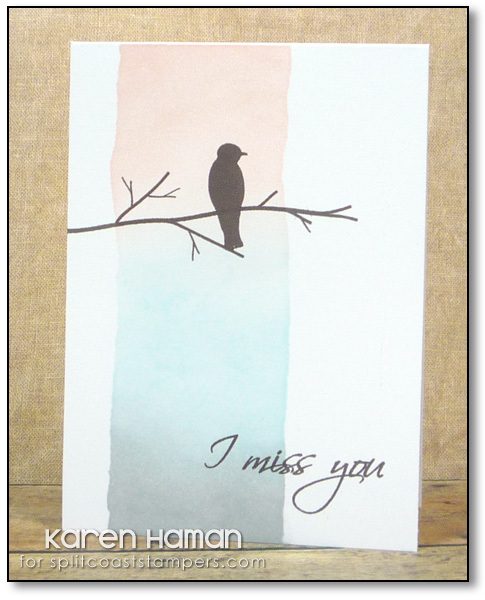 For this card, I remember being inspired by the winter sky – I wanted to capture the bleak colors. I used masking paper to create a vertical opening on my card base. I sponged the distress inks into that space, keeping it a light touch. After removing the masking, I added the stamped images. The card is a true one-layer card. This was one of my favorites from the month.